African Footprint invited as headline entertainment for first FIFA Banquet for World Cup Soccer 2010. Dignitaries included President Zuma and Sepp Blatter, President of FIFA. African Footprint invited to be the main act/entertainment at the launch of the new high speed train in South Africa. Direct from France, African Footprint returned to celebrate their 10th Birthday at Emperors Palace. African Footprint invited to perform on Television Show, Vivement Dimanche at the request of French Soccer Coach, Raymond Domenech. Invited to welcome the World Cup Trophy to France. Performance at Casino de Paris and meeting with soccer legends such as Roger Milla. 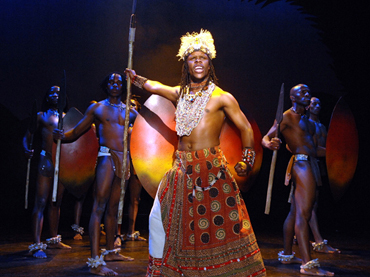 African Footprint tours France for 6 weeks including 2 weeks at the Casino de Paris theatre in Paris. African Footprint invited to perform excerpts of the show in front of 80 000 people prior to soccer match between France and Spain. Excerpts of African Footprint performed live to 8 million people in France as part of Reality Programme, Celebrites Ferme en Afrique. The show performed on the Canals of Martigues as the Guest Spectacle for one show only. The show is chosen to be the closing act for the Presidential Inaugural of President Zuma at Teatro Theatre, Monte Casino. The show performed at Casino du Liban, Beirut for 2 weeks in February, 2009. Richard Loring received the “Paris Match Award” for his work on African Footprint. Footprint returns to Mexico and the USA. Highlight in Mexico: Being invited to be the opening Act for the LUNAS DEL AUDITORIO Award Ceremony. Footprint returns to its home in Johannesburg for a 6 week season. Lyon Convention Center, Lyon for South African Tourism’s “International Destination Expo”. Guest of Honour: Danny Glover. Started their Winter Tour in Alaska, followed by 7 weeks of touring the United States. The show was hailed in all areas and most theatres have already booked the show for a return season in late 2008. Invited to New Orleans in support of the Katrina disaster victims fund. Top Oscar Award winning actor, Lou Gosset, introduced the show on a nightly basis in support of this South African product. African Footprint debuts in Mexico. Billed as most popular production at the Festival and is invited back to Mexico in October, 2008. 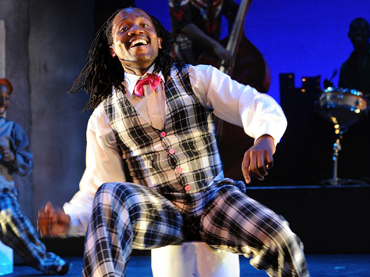 African Footprint invited back to Munich, Germany for a return season to the Deutches Theatre. The tour continued through Holland. Returns to India to perform at SA National Day (27 April) celebrations in Mumbai, Bangalore, Delhi, Calcutta and Chennai. The event was also to celebrate the Centenary of Mahatma Ghandi beginning his fight for freedom. International Cast returns to The Globe at Gold Reef City Casino for a limited season in order to participate in the Casino’s 6th Birthday Celebrations. Cast invited to perform at the CAF Awards Ceremony in Ghana. Returns to Macufe Festival in Bloemfontein by popular demand. 10 shows during the Festival Season. Cast is selected to perform at the Opening Ceremony in Marrakech, Morocco at FIFA’s 55th Ordinary Congress for Sepp Blatter. “African Footprint” shows its support of the Choc “Cow Parade” Fundraising Initiative by the purchase of its very own ceramic cow, IZINYAMOO. The cast flew from Zurich to London to perform at St James’ Palace for the Duke of Edinburgh World Fellowship 18th Anniversary Dinner. The cast performed a 30-minute excerpt of the show for His Royal Highness the Duke of Edinburgh and his distinguished guest from around the world. The international touring company, after returning from Europe for a two-week break, returned to Germany where they are performed in Bremen. This third leg of the the European tour saw the cast travel to Bremen, Cologne, Zurich, Roermond, Amsterdam, Nijmegen, Hoogeven, Frankfurt, Dresden, Leipzig and Mannheim. During a break in South Africa, the cast of “African Footprint” celebrated their 5th Birthday. The international touring company, undertook their second leg of the European tour which took them to Basel, Amsterdam, Bremen, Frankfurt, Dresden, Cologne and Mannheim. 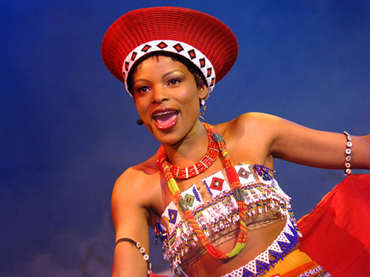 A special performance of the show is staged at the Izulu Theatre in aid of the recent Tsunami Victims. 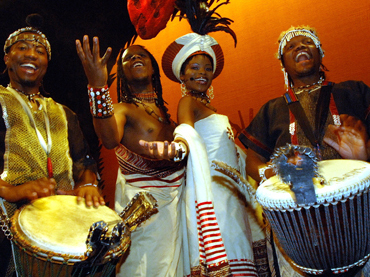 Theatre, Sibaya Casino and Entertainment Kingdom in KwaZulu Natal until May, 2005. “African Footprint” opens for a 6-week season in Basel, Bologna, Vienna and Hamburg. “African Footprint”, South Africa’s longest running musical, closes in Johannesburg after 4 and a half years sell out season at Gold Reef City Casino. “African Footprint” announced three-year contract with German promoter Mr Wolfgang Bocksch. First leg of the tour in Cologne on 17th July, 2004 and then onto Mannheim, Hamburg, Berlin and Frankfurt. “African Footprint” opened at the prestigious Sporting Club in Monte Carlo and played until 15th July, 2004. “African Footprint” cast CD hits gold status. 20 000 CD Sold. “African Footprint” celebrated their fourth birthday at The Globe Theatre, Gold Reef City Casino. “African Footprint” performed their debut show in Tel Aviv after which they travelled to Haifa for a series of performances. 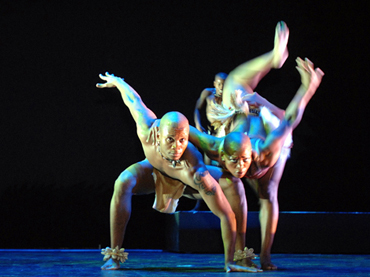 The cast of “African Footprint” performed excerpts from the show at the opening of Parliament in Cape Town. 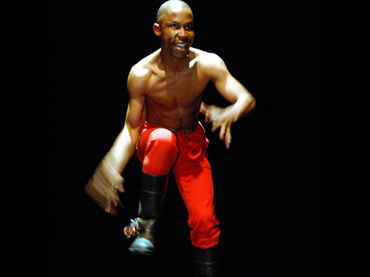 Show wins 2 Naledi Awards for: Best Original Choreography and Best Lighting. Show returns to Cape Town for a 7-week season. Season runs to 29th February, 2004. New season opens at The Globe Theatre with the third cast. Highly acclaimed 5-month tour of Australia. Creative partnership formed to develop and train young local talent. "African Footprint" invited to India by the South African High Commission to perform at their events in New Delhi, Mumbai and Hyderabad in celebration of the 10th Anniversary of the South Africa-India Diplomatic Relations. “African Footprint" invited to perform excerpts of the show at the Opening Ceremony of the ICC Cricket World Cup at Newlands Cricket Ground, Cape Town. Documentary Video and DVD entitled "African Footprint…..Step By Step" released. 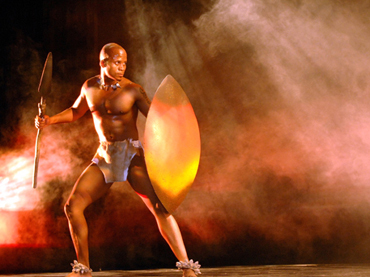 First theatre production to be granted "Proudly South African" status. As a result of Bravo China Television Spectacular, “African Footprint” is invited to perform in the People's Republic of China. 14 Performances in 5 provinces – Audiences of 3 000 per venue. “Bravo China Television Spectacular” viewed in China by approximately 400 million viewers. Declared “African Footprint Day” by Mayor of Atlanta. Performed in Atlanta, USA as guests of Ambassador Andrew Young. “African Footprint” the only South African group invited to perform at Sun City for the International Indian Film Festival Awards. Television spectacular screened globally. Hosted by celebrities including Bo Derek. Civil Society, Johannesburg – Performed before Nelson Mandela and Bill Clinton. Show wins 3 Vita Awards for: Best Ensemble Piece, Best Lighting, Best Musical. 1st Night Records, London, releases “Original Cast Recording”. Local & International distribution. Guest of Honour: President Thabo Mbeki. South Africa’s premier Millennium event, viewed by a global audience of millions. Guests of Honour: Nelson Mandela, President Thabo Mbeki and International guests.